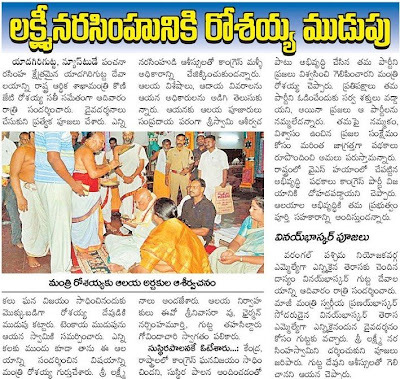 Mr. Konijeti Roasaiah, Finanace minister of the Andhra pradesh state was visited Yadagirigutta temple yesterday and offered special puja in view of their victory in elections. Mr. Komatireddy Rajagopal Reddy, winner of the Bhongir MP constituency was visited Yadagirigutta yesterday and offered special puja in view of his victory in elections. 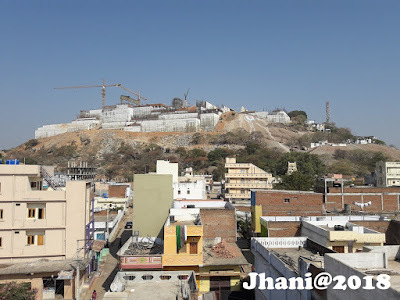 this is a first time elections for Bhongir Lokasabha (MP) consitiuency since the revised and reconstructed of the constituencies in Inida and Yadagirigutta now under Bhongir Lokasabha constituency as well as under Aler Assembly constituency (Winner : Bixapathy Goud), in the both segments Congress candidates are elected.